Wareham bed and breakfast travel guide for romantic, historic and adventure b&b's. 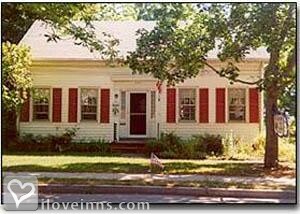 Browse through the iLoveInns.com database of Wareham, Massachusetts bed and breakfasts and country inns to find detailed listings that include room rates, special deals and area activities. You can click on the 'check rates and availability' button to contact the innkeeper. Wareham, Massachusetts is near Sandwich Glass Museum, part of the Sandwich Historical Society. For wine-lovers a trip to Cape Cod Winery is an opportunity. Wareham is near New Bedford, where the famous New Bedford Whaling Museum is found. The town's Art Museum is also an attraction. Highfield Hall in nearby Falmouth is an interesting mansion built in 1878. Buttonwood Park Zoo is one of the oldest zoos in the country. For those who want to see the top historical and cultural sites in neighboring Plymouth, joining Colonial Lantern Tours is recommended. Innkeepers at Wareham bed and breakfast inns can arrange reservations for this. Other attractions near Wareham are Plymouth Bay Winery, Pilgrim Hall Museum, and Woods Hole Historical Museum. By Mulberry B&B.